5. Porosity and permeability versus barrier function? DIMITRIOU et al. (2012) describe the importance of the pore size for the porosity of barrier membranes. On one hand, the pore dimensions must prevent the ingrowth of connective tissue into the covered zone of bone regeneration, but on the other hand they must allow angiogenic access of the membrane body. The three-dimensional topography of a barrier membrane and the presence of an interconnecting pore system can affect the cell occlusiveness and the biological response from different cell types (DIMITRIOU et al., 2012). 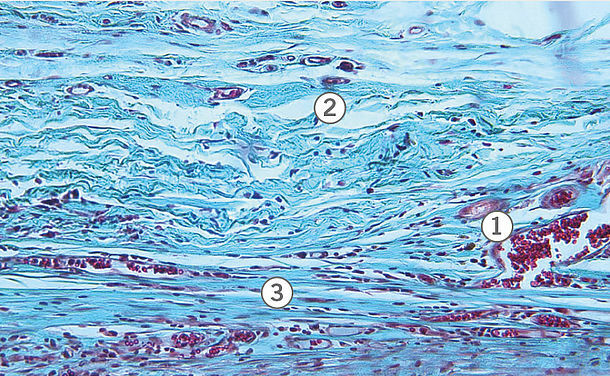 Investigations of a native cross-linked porcine membrane derived from a tissue not specified in more detail (BG) revealed that after placement of the implants in the mandible and maxilla of a beagle there was a reduction in the membrane thickness between 2 and 4 weeks after implant placement (SCHWARZ et al., 2008) and full angiogenic development into the membrane body and good tissue integration after 2 weeks. For the same experimental design, ROTHAMEL et al. (2012) reported complete vascularisation of the membrane body after 4 weeks and almost complete degradation after 8 weeks. Twelve weeks after implant placement SCHWARZ et al. (2008) and ROTHAMEL et al. (2012) observed complete degradation of the membrane. ZUBERY et al. (2007) implanted the same membrane in the maxilla only of beagles and reported a temporal degradation pattern for the membrane that differed from the previous studies. Moderate degradation was observed after 16 weeks and complete degradation was only seen after 24 weeks. The membrane (BG) was also implanted in the mandible and maxilla of rats. After 2 weeks the researchers reported vascularisation of the membrane body and a mild inflammatory reaction and after 12 weeks they observed severe degradation of the membrane (van LEEUWEN et al., 2012). Vascularisation of the membrane body and an inflammatory reaction around the membrane were observed 2 weeks after placement of the same membrane subcutaneously in the backs of rats (ROTHAMEL et al., 2005; ZHAO et al., 2000). Resorptive processes were observed after 3 weeks (ROTHAMEL et al., 2005). A reduction in the thickness of the membrane and almost complete degradation after 4 weeks were described by ZHAO et al. (2000). SCHWARZ et al. (2006a) also observed significant degradation of the membrane 8 weeks after placement. Compared to the studies on rats that have been published, a different pattern of degradation of the BG was observed over time with subcutaneous placement in the backs of mice. The membrane thickness and volume stability were preserved, and 30 days after placement good tissue integrity and no signs of degradation were observed. The membrane body was also described as structurally intact 60 days after placement (GHANAATI, 2012). In the calvaria of rats, a reduction in the thickness of the membrane body of 60% was observed after 7 weeks (MOSES et al., 2009). In the calvaria of rabbits, a reduction in the thickness of the membrane body was reported 6 weeks after placement as well as full degradation after 12 weeks (ARX et al., 2005). The placement of another porcine membrane (pericardial membrane, PM)1 in the mandible and maxilla of beagles also showed good tissue integration after 4 weeks compared to the BG membrane in the same study but for the most part degradation only occurred after 12 weeks (ROTHAMEL et al., 2012). With the PM membrane placed subcutaneously in the backs of rats, an inflammatory response and mild vascularisation dependent on the particular surface property was observed by BARBECK et al. (2014). The volume and structural stability of the PM was comparable to that of the BG over 30 days (BARBECK et al., 2014; GHANAATI, 2012). The study results are summarised in tables 1 and 2 in the appendix. The transferability of the results from animal studies to humans and thus their clinical relevance is frequently and critically discussed (for a summary, see SHANKS et al., 2009; AUER et al. 2007; LIEBSCHNER, 2004).